Priyanka Thakur did her B Sc in Horticulture and M Sc in Floriculture & Landscaping, post that she did her PhD in Floriculture & Landscaping from Dr Y S Parmar University. 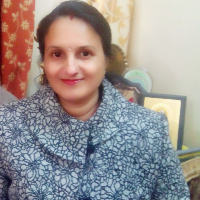 She is working as a Principal Floriculturist at RHRTS, Dhaulakuan, Dr Y S Parmar University of Horticulture & Forestry. Floristry is the production, commerce and trade in flowers. It encompasses flower care and handling, floral design, or flower arranging, merchandising, and display and flower delivery. "After doing my B Sc in Horticulture and M Sc in Floriculture & Landscaping, I did my PhD in Floriculture & Landscaping from Dr. Y S Parmar University. I am working as a Principal Floriculturist at Dr. Y S Parmar University of Horticulture & Forestry." Floriculture or flower farming is a discipline of horticulture concerned with the cultivation of flowering and ornamental plants for gardens and for floristry, comprising the floral industry. The development, via plant breeding, of new varieties is a major occupation of floriculturists. "After doing my B Sc in Horticulture and M Sc in Floriculture & Landscape, I did my PhD in Floriculture & Landscape from Dr. Y S Parmar University. I am working as a Principal Floriculturist at Dr. Y S Parmar University of Horticulture & Forestry."